I am a member of the editorial board of the Journal of Automated Reasoning, Springer. I am a member of the editorial board of the Journal of Applied Non-Classical Logic, Taylor & Francis. Special Issue of Selected Extended Papers of CADE-22. Together with Brigitte Pientka (eds). Journal of Automated Reasoning 47 (2) (2011). 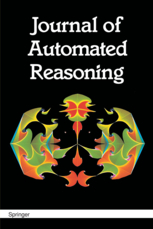 Special Issue on Practical Aspects of Automated Reasoning. Boris Konev, Renate A. Schmidt, Stephan Schulz (eds). AI Communications 23 (2-3) (2010). Special issue on Empirically Successful Computerized Reasoning. Renate A. Schmidt, Geoff Sutcliffe, Stephan Schulz (eds). Journal of Applied Logic 7 (1) (2009). Special issue on Relations and Kleene Algebras in Computer Science. Renate A. Schmidt, Georg Struth (eds). Journal of Logic and Algebraic Programming 76 (1) (2008). Special Issue on Implementation of Logics. Boris Konev, Renate Schmidt, Stephan Schulz (eds). Journal of Applied Non-Classical Logic 16 (1-2) (2006). BiBTeX, Full text via JANCL. Relations and Kleene Algebra in Computer Science. R. A. Schmidt (ed), Lecture Notes in Computer Science, Vol. 4136, Springer (2006). Abstract, BiBTeX, Full text via Springer. Advances in Modal Logic, Volume 5. R. A. Schmidt, I. Pratt-Hartmann, M. Reynolds, and H. Wansing (eds). King's College Publications, London (2005). Automated Reasoning with Analytic Tableaux and Related Methods. The 26th International Conference, TABLEAUX 2017, Brasilia, Brazil, September 25-28, 2017, Proceedings. Together with C. Nalon (eds), Lecture Notes in Artificial Intelligence, Vol. 10501, Springer. Frontiers of Combining Systems-FroCoS 2013. 9th International Symposium on Frontiers of Combining Systems, Nancy, September 18-20, 2013. Proceedings. P. Fontaine, C. Ringeissen and R. A. Schmidt (eds). Lecture Notes in Artificial Intelligence, Vol. 8152, Springer (2013). PAAR-2012: Proceedings of the Third Workshop on Practical Aspects of Automated Reasoning. P. Fontaine, R. A. Schmidt and S. Schulz (eds). EPiC Series, Vol. 21, EasyChair (2013). Proceedings of the Second International Workshop on Practical Aspects of Automated Reasoning (PAAR-2010). Konev, B., Schmidt, R. and Schulz, S. (eds), EPiC Series, Vol. 9, EasyChair (2012). Automated Deduction-CADE-22. 22nd International Conference on Automated Deduction, Montreal, Canada, August 2-7, 2009. Proceedings. Schmidt, R. A. (ed), Lecture Notes in Artificial Intelligence, Vol. 5663, Springer (2009). Reasoning Web: Semantic Technologies for Information Systems. 5th International Summer School 2009, Brixen-Bressanone, Italy, August 30-September 4, 2009, Tutorial Lectures. Tessaris, S., Franconi, E., Eiter, Th., Gutierrez, C., Handschuh, S., Rousset, M.-C. and Schmidt, R. A. (eds), Lecture Notes in Computer Science: Information Systems and Applications, incl. Internet/Web, and HCI, Vol. 5689, Springer (2009). Proceedings of the LPAR Workshops: Knowledge Exchange: Automated Provers and Proof Assistants, and The 7th International Workshop on the Implementation of Logics (KEAPPA & IWIL 2008). Rudnicki, P., Sutcliffe, G., Konev, B., Schmidt, R., and Schulz, S. (eds), CEUR Workshop Proceedings, Vol. 418 (2008). Abstract, BiBTeX, Full text via CEUR. Proceedings of the First International Workshop on Practical Aspects of Automated Reasoning (PAAR-2008/ESHOL-2008). B. Konev, R. A. Schmidt and S. Schulz (eds). CEUR Workshop Proceedings, Vol. 373 (2008). Proceedings of the FLoC'06 Workshop on Empirically Successful Computerized Reasoning (ESCoR), 3rd International Joint Conference on Automated Reasoning. G. Sutcliffe, R. Schmidt and S. Schulz (eds). CEUR Workshop Proceedings, Vol. 192 (2006). AiML-2004: Advances in Modal Logic. R. Schmidt, I. Pratt-Hartmann, M. Reynolds and H. Wansing (eds). Technical Report UMCS-04-09-01, University of Manchester, UK (2004). Fourth International Workshop on the Implementation of Logics. B. Konev and R. Schmidt (eds). Technical Report ULCS-03-018, University of Liverpool (2003). The International Conference on Automated Deduction (CADE) (Trustee 2008-2015 & 2016-, Vice-President 2011-2015, CADE Skolem Award Committee 2017, 2019). British Logic Colloquium (Trustee, since 2017). Automated Reasoning with Analytic Tableaux and Related Methods (TABLEAUX) (Steering committee member, since 2014). Frontiers of Combining Systems (FroCoS) (Steering committee member, since 2012). Practical Aspects of Automated Reasoning (Co-Founder, Steering Committee member, since 2014). Advances in Modal Logic Initiative (AiML) (Steering committee member, 2002-2010). Relational Methods in Computer Science (RelMiCS) (Steering committee member, 2005-2014). Automated Reasoning Workshop (Organising committee member 2002-2018). SOQE 2017: Workshop on Second-Order Quantifier Elimination and Related Topics, 6-8 Dec. 2017, Dresden (PC Co-Chair). The 26th International Conference on Automated Reasoning with Analytic Tableaux and Related Methods (TABLEAUX 2017), 25-28 Sep. 2017, Brasilia (PC Co-Chair). 9th International Symposium on Frontiers of Combining Systems (FroCoS 2013), 18-20 Sep. 2013, Nancy, France (PC Co-Chair). The 3rd Workshop on Practical Aspects of Automated Reasoning (PAAR-2012), 30 Jun. - 1 Jul. 2012, Manchester (Co-Chair). The 19th Automated Reasoning Workshop, 2-4 April 2012, Manchester (Chair). FLoC/IJCAR Workshop on Practical Aspects of Automated Reasoning (PAAR-2010), 14 Jul. 2010, Edinburgh (Co-Chair). The 22nd International Conference on Automated Deduction (CADE-22), 2-7 Aug. 2009, Montreal (PC Chair). Seventh International Workshop on the Implementation of Logics (IWIL-2008), 22 Nov, 2008, Doha, Qatar (Co-Chair). IJCAR Workshop on Practical Aspects of Automated Reasoning (PAAR-2008), 10-11 Aug. 2008, Sydney (Co-Chair). Relations and Kleene Algebra in Computer Science, 29 Aug. - 2 Sep. 2006, Manchester (General chair, local organiser). Empirically Successful Computerized Reasoning (ESCoR), 21 Aug. 2006, Seattle (Organiser, PC member). Workshop of Tarski EU COST Action 274, 12-13 September 2004, Manchester (Local organiser). Advances in Modal Logics 2004 (AiML-2004), 9-11 September 2004, Manchester (Local organisation chair, PC member). Workshop on the Implementation of Logics'2003, 27 September 2003, Almaty, Kazakhstan (Co-Chair). The 32nd International Workshop on Description Logics (DL 2019), 18-21 Jun. 2019, Oslo, Norway (PC member). The 28th International Joint Conference on Artificial Intelligence (IJCAI 2019), 10-16 Aug. 2019, Macau, China (PC member). The 27th International Conference on Automated Deduction (CADE-27), 25-30 Aug. 2019, Natal, Brazile (PC member). The 27th International Conference on Automated Reasoning with Analytic Tableaux and Related Methods (TABLEAUX 2019), 3-5 Sep. 2019, London (PC member). 12th International Symposium on Frontiers of Combining Systems (FroCoS 2019), 4-6 Sep. 2019, London (PC member). The Thirty-Third AAAI Conference on Artificial Intelligence (AAAI 2019), 27 Jan. - 1 Feb. 2019, Honolulu, Hawaii, USA (PC Member). The 31th International Workshop on Description Logics (DL 2018), 26-29 Oct. 2018, Tempe, Arizona (PC member). 25th International Symposium on Temporal Representation and Reasoning (TIME 2018), 15-17 Oct. 2018, Warsaw, Poland (PC Member). The 27th International Joint Conference on Artificial Intelligence and the 23rd European Conference on Artificial Intelligence (IJCAI-ECAI 2018), 13-19 July 2018, Stockholm, Sweden (PC member). The 9th International Joint Conference on Automated Reasoning (IJCAR 2018), 14-17 July 2018, Oxford, UK (PC member). SOQE 2017: Workshop on Second-Order Quantifier Elimination and Related Topics, 6-8 Dec. 2017, Dresden (PC Member). 24th International Symposium on Temporal Representation and Reasoning (TIME 2017), 16-18 Oct. 2017, Mons, Belgium (PC Member). The First International ARCADE (Automated Reasoning: Challenges, Applications, Directions, Exemplary Achievements) Workshop, 6 Aug. 2017, Gothenburg (PC member). The 26th International Conference on Automated Deduction (CADE-26), 6-11 Aug. 2017, Gothenburg (PC member). Advances in Modal Logics 2016 (AiML-2016), 30 Aug. - 2 Sep. 2016, Budapest, Hungary (PC member). The 5th Workshop on Practical Aspects of Automated Reasoning (PAAR-2016), 2 Jul. 2016, Coimbra, Portugal (PC member). The 8th International Joint Conference on Automated Reasoning (IJCAR 2016), 27-30 June 2016, Coimbra, Portugal (PC member). The 15th International Conference on Relational and Algebraic Methods in Computer Science (RAMiCS 15), 28 Sep.-1 Oct. 2015, Braga, Portugal (PC member). The 24th International Conference on Automated Reasoning with Analytic Tableaux and Related Methods, 20-25 Sep. 2015, Wroclaw, Poland (PC member). 10th International Symposium on Frontiers of Combining Systems (FroCoS 2015), 19-24 Sep. 2015, Wroclaw, Poland (PC member). 1st Workshop on Logics for Qualitative Modelling and Reasoning (LQMR'15), 13-16 Sep. 2015, Lodz, Poland (PC member). The 25th Jubilee Edition of the International Conference on Automated Deduction (CADE-25), 1-7 Aug 2015, Berlin (PC member). Advances in Modal Logics 2014 (AiML-2014), 5-8 Aug. 2014, Groningen (PC member). ARW-DT 2014: Joint Automated Reasoning Workshop and Deduktionstreffen, 23-24 July 2014, Vienna (PC member). The 4th Workshop on Practical Aspects of Automated Reasoning (PAAR-2014), 23 Jul. 2014, Vienna (PC member). The 7th International Joint Conference on Automated Reasoning (IJCAR 2014), 19-21 July 2014, Vienna (PC member). Workshop on Automated Deduction: Decidability, Complexity, Tractability (ADDCT'14), 18 July 2014, Vienna (PC member). The 27th International Workshop on Description Logics (DL 2014), 17-20 July 2014, Vienna (PC member). The 14th International Conference on Relational and Algebraic Methods in Computer Science (RAMiCS 14), 27 Apr - 1 May 2014, Marienstatt im Westerwald, Germany (PC member). The 22nd International Conference on Automated Reasoning with Analytic Tableaux and Related Methods, 16-19 Sep. 2013, Nancy, France (PC member). The 26th International Workshop on Description Logics (DL 2013), 23-26 July 2013, Ulm, Germany (PC member). The 24th International Conference on Automated Deduction (CADE-24), 9-14 June 2013, Lake Placid, USA (PC member). CADE Workshop on Automated Deduction: Decidability, Complexity, Tractability (ADDCT'13), 10 June 2013, Lake Placid (PC member). The 13th European Conference on Logics in Artificial Intelligence (JELIA 2012), 26-28 Sept 2012, Toulouse (PC member). The 13th International Conference on Relational and Algebraic Methods in Computer Science (RAMiCS 13), 17-21 Sep. 2012, Cambridge (PC member). The 20th European Conference on Artificial Intelligence (ECAI 2012), 27-31 Aug. 2012, Montpellier (PC member). Advances in Modal Logics 2012 (AiML-2012), 22-25 Aug. 2012, Copenhagen (PC member). The 25th International Workshop on Description Logics (DL 2012), 7-10 Jun. 2012, (PC member). Nineth International Workshop on the Implementation of Logics (IWIL-2012), 10 Mar. 2012, Merida, Venezuela (PC member). 8th International Symposium on Frontiers of Combining Systems (FroCoS 2011), 5-7 Oct. 2011, Saarbrücken (PC member). The 23rd International Conference on Automated Deduction (CADE-23), 31 Jul.-5 Aug. 2011, Wroclaw, Poland (PC member). The 20th International Conference on Automated Reasoning with Analytic Tableaux and Related Methods, 4-8 July 2011, Bern, Switzerland (PC member). The 11th International Workshop on First-Order Theorem Proving, 4 July 2011, Bern, Switzerland (PC member). The 12th International Conference on Relational and Algebraic Methods in Computer Science (RAMiCS 12), 30 May - 3 Jun. 2011, Rotterdam, The Netherlands (PC member). Deduktionstreffen 2010, 20-21 Sep. 2010, Karlsruhe, Germany (Organisation/PC member). The 12th European Conference on Logics in Artificial Intelligence (JELIA 2010), 13-15 Sept 2010, Helsinki (PC member). Reasoning Web 2010 Summer School, 30 Aug.-3 Sep. 2010, Dresden (PC member). Advances in Modal Logics 2010 (AiML-2010), 24-27 Aug. 2010, Moscow (PC member). The 19th European Conference on Artificial Intelligence (ECAI 2010), 16-20 Aug. 2010, Lisbon (PC member). International Conference on Algebra and Logic, Theory and Applications, 19-25 July 2010, Krasnoyarsk, Russia (PC member). The 5th International Joint Conference on Automated Reasoning (IJCAR 2010), 16-19 July 2010, Edinburgh (PC member). FLoC/LiCS/IJCAR Workshop on Comparing Logical Decision Methods (CLoDeM-2010) , 15 Jul. 2010, Edinburgh (PC member). Relational Methods in Computer Science and Applications of Kleene Algebra (RelMiCS/AKA 2009), 1-5 Nov. 2009, Doha, Qatar (PC member). Deduktionstreffen 2009, 15-16 Oct. 2009, Bremen, Germany (Organisation/PC member). 7th International Symposium on Frontiers of Combining Systems (FroCoS 2009), 16-18 Sep. 2009, Trento (PC member). The 10th International Workshop on Computational Logic in Multi-Agent Systems (CLIMA X), 9-10 Septemper 2009, Hamburg (PC member). Reasoning Web 2009 Summer School, 30 Aug.-4 Sep. 2009, Bozen/Bolzano (PC member). The 22nd International Conference on Automated Deduction (CADE-22), 2-7 Aug. 2009, Montreal (PC Chair, PC member). Twenty-first International Joint Conference on Artificial Intelligence (IJCAI-09), 11-17 July 2009, Pasadena (PC member). International Workshop on First-Order Theorem Proving (FTP 2009), 6-7 July 2009, Oslo (PC member). Seventh International Workshop on the Implementation of Logics (IWIL-2008), 22 Nov. 2008, Doha, Qatar (Co-Chair, PC member). The 9th International Workshop on Computational Logic in Multi-Agent Systems (CLIMA IX), 29-30 Septemper 2008, Dresden (PC member). European Conference on Logics in Artificial Intelligence (JELIA 2008), Sept 28 - Oct 1, 2008 (PC member). KR Workshop on Knowledge Representation for Agents and Multi-Agent Systems (KRAMAS 2008), Sept 16-19, 2008 (PC member). Advances in Modal Logics 2008 (AiML-2008), 9-12 Sep. 2008, Nancy (PC member). IJCAR Workshop on Complexity, Expressibility, and Decidability in Automated Reasoning (CEDAR'08), 10 Aug. 2008, Sydney (PC member). Relational Methods in Computer Science and Applications of Kleene Algebra (RelMiCS/AKA 2008), 6-11 Apr. 2008, Frauenchiemsee, Germany (PC member). Deduction Meeting 2008, 17-18 Mar. 2008, Saarbrücken, Germany (PC member). Twentieth Australian Joint Conference on Artificial Intelligence (AI07), 2-6 December 2007, Gold Coast, Queensland (PC member). Methods for Modalities 2007 (M4M-5), 29-30 Nov 2007, Cachan, France (PC member). Computational Logic in Multi-Agent Systems VIII (CLIMA VIII), 10-11 Septemper 2007, Porto (PC member). CADE Workshop on Disproving: Non-Theorems, Non-Validity, Non-Provability, 16 July 2007, Bremen (PC member). CADE Workshop on Automated Deduction: Decidability, Complexity, Tractability (ADDCT'07), 15 July 2007, Bremen (PC member). Sixth International Joint Conference on Autonomous Agents and Multiagent Systems (AAMAS'07), 14-18 May 2007, Honolulu, Hawai'i (PC member). Automated Reasoning Workshop 2007, 19-20 April 2007, London (PC member). Advances in Modal Logics 2006 (AiML-2006), 25-28 Sep. 2006, Noosa, Queensland, Australia (PC member). European Conference on Logics in Artificial Intelligence (JELIA'06), 13-15 September 2006, Liverpool (PC member). Relations and Kleene Algebra in Computer Science, 29 Aug. - 2 Sep. 2006, Manchester (General chair, local organiser, PC member). Workshop on Disproving: Non-Theorems, Non-Validity, Non-Provability, 16 Aug. 2006, Seattle (PC member). Computational Logic in Multi-Agent Systems VII (CLIMA VII), 8-9 May 2006, Hakodate, Japan (PC member). Fifth International Joint Conference on Autonomous Agents and Multiagent Systems (AAMAS'06), 8-12 May 2006, Hakodate, Japan (PC member). Automated Reasoning Workshop 2006, 3-4 April 2006, Bristol (PC member). Methods for Modalities 2005, 1-2 December 2005, Berlin (PC member). International Workshop on First-Order Theorem Proving 2005 (FTP-2005), 12-16 September 2005, Koblenz, Germany (PC member). Automated Reasoning Workshop 2005, 29-30 July 2005, Edinburgh (PC member). Fourth International Joint Conference on Autonomous Agents and Multiagent Systems (AAMAS'05), 25 - 29 July 2005, Utrecht (PC member). CADE 2005 Workshop on Disproving: Non-Theorems, Non-Validity, Non-Provability, 22 July 2005, Tallin, Estonia (PC member). Computational Logic in Multi-Agent Systems VI (CLIMA VI), June 2005, London (PC member). Fifth International Workshop on the Implementation of Logics (IWIL-2004), March 2005, Montevideo, Uruguay (PC member). European Conference on Logics in Artificial Intelligence (JELIA'04), 27-30 September 2004, Lisbon (PC member). Computational Logic in Multi-Agent Systems V (CLIMA V), 28-29 September 2004, Lisbon (PC member). IJCAR 2004 Workshop on Disproving: Non-Theorems, Non-Validity, Non-Provability, 4-8 July 2004, Cork, Ireland (PC member). IJCAR 2004 Doctoral Programme, 4-8 July 2004, Cork, Ireland (PC member). Automated Reasoning Workshop 2004, 31 March-1 April 2004, Leeds (PC member). Computational Logic in Multi-Agent Systems IV, 6-7 January 2004, Florida (PC member). Methods for Modalities 2003, 22-23 September 2003, Nancy (PC member). Automated Reasoning Workshop 2003, 15-16 April 2003, Liverpool (PC member). Workshop on the Implementation of Logics'2002 (PC member). Advances in Modal Logics 2002 (PC member). Methods for Modalities 2001 (PC member). IJCAR workshop on Issues in the Design and Experimental Evaluation of Systems for Modal and Temporal Logics 2001 (PC member). Automated Forgetting and Uniform Interpolation: Three Tools. Invited talk, SOQE 2017: Workshop on Second-Order Quantifier Elimination and Related Topics, Dresden, Dec. 2017. Automated Forgetting and Uniform Interpolation for Description Logics. Invited talk, 12th Workshop on Logical and Semantic Frameworks with Applications (LSFA 2017), Brasilia, Sept. 2017. Synthesising Terminating Tableaux for Non-Classical Logics. Invited talk, 4th Conference on Nonclassical Logics, Theory and Applications, Lodz, 2011. Synthesising Terminating Tableaux for Relational Logics. Invited talk, 12th International Conference on Relational and Algebraic Methods in Computer Science (RAMiCS 12), Rotterdam, 2011. Simulation and Synthesis of Deduction Calculi. Key note presentation, Methods for Modalities 2009 (M4M-6), Copenhagen, 2009. Developing Modal Tableaux and Resolution Methods via First-Order Resolution. Key note presentation, Deduktionstreffen, Koblenz, Germany, 2007. Developing Modal Tableaux and Resolution Methods via First-Order Resolution. Key note presentation, Sixth International Conference on Advances in Modal Logic (AiML 2006), Noosa, Australia, 2006. Uniform Interpolation and Forgetting for Description Logics. 'Algebra, Logic, and Algorithms' seminar, Schools of Mathematics and Computing, University of Leeds, 2014. Automated Prover Development with MetTeL for Non-Classical Logics. Seminar, McGill University, 2014. Computing Uniform Interpolants for Description Logics. Seminar, Universitaet Koblenz, 2013. Computing Uniform Interpolants for Description Logics. Seminar, Max-Planck Institut fur Informatik, Saarbrucken, 2013. Second-Order Quantifier Elimination. Oxford Advanced Seminar on Informatic Structures, Computing Laboratory, University of Oxford, 2009. Second-Order Quantifier Elimination. Departmental Seminar, Department of Computer Science, University of Liverpool, 2008. Second-Order Quantifier Elimination. Departmental Wednesday Seminar, Computer Laboratory, University of Cambridge, 2008. A General Tableau Method for Deciding Description Logics and Related Logics. NICTA LC Seminar, NICTA, Canberra, 2008. Developing Modal Tableaux and Resolution Methods via First-Order Resolution. Invited seminar, Max-Planck Institut fur Informatik, Saarbrucken, 2006. First-Order Resolution Methods for Description Logics. Invited seminar, Department of Computer Science, University of Sheffield, 2005. Resolution-Based Theorem Proving for Modal and Description Logic, FIRST Autumn School on Modal Logic, 10-11 Nov 2009, Copenhagen. Resolution-Based Theorem Proving for Description and Modal Logics, KRDB Spring School 2008, 14 April 2008, Bolzano.